It's been a long time since I have sewn for Roger...he more than deserved a new shirt. I showed him a shirt made of wool gauze that I had designed for a client, and he really liked the fabric. So yesterday while watching a few old episodes of Nip/Tuck...I found some more wool gauze in my stash and made this new shirt for him. This shirt is of my original design, and is made from washed 100% wool "double-gauze". 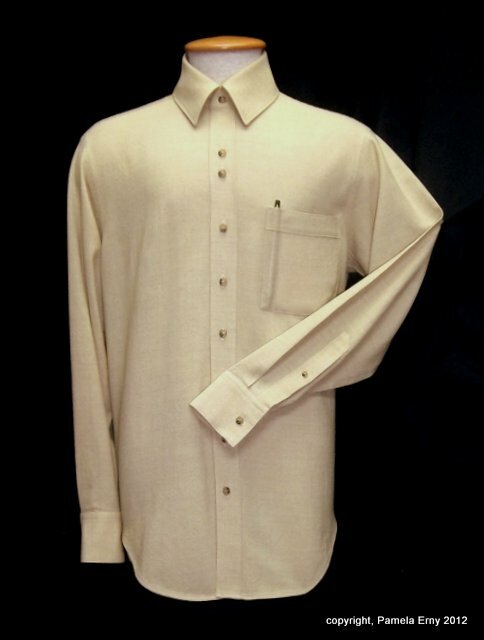 It features a tall standing collar, a "Cigar Pocket", and a double button treatment near the top of the front placket. Because the fabric is quite lightweight, I used Pro-Sheer Elegance Fusible to interface the front button plackets, and 2 layers of ProSheer Elegance Fusible to interface the collar, collar stand, and cuffs. The buttons are imported Italian Designer Shirt Buttons, in the "Choco-Toffee" color. Buttons and Interfacing both from www.FashionSewingSupply.com .